The Foothills Trail – what could possibly go wrong? 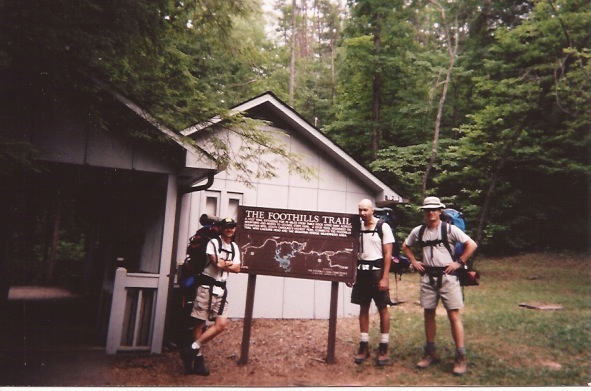 It is Monday evening and as I write this, Melissa’s family is en route to Raleigh for our much-anticipated backpacking trip along the Foothills Trail in northwestern South Carolina. We have been planning this trip for months and it is finally upon us. I’m ready to don my pack and hit the trail – eager to do a little mindless ambling, away from phone calls and texts and the histrionics of 24/7 news cycles. I’m ready for the deprivation that backpacking brings – no icy drinks, comfortable mattresses or clean sheets – no air conditioning, hot showers, flush toilets or lovingly prepared home-cooked meals. Because the only way to really appreciate these things is to be without them, even if just for just a few days. This will be a guy’s trip – a classic male bonding retreat into the deep woods and hills. We’ll don backpacks and with creaking knees, shuffle laboriously through a corridor of trees, along high ridges, past comely waterfalls and across river valleys. At day’s end we’ll make camp, resting tired legs while pushing home quivering spoonfuls of reconstituted, freeze-dried beef stroganoff. As the summer sun, nearing Solstice, makes its lazy descent and we sit transfixed by the warm glow of campfire, we’ll sip bourbon, trading stories and laughs. Its going to be hot and grubby and hard. We’re going to stink. Its going to be awesome. Joining me on this little excursion is Melissa’s Dad, Fran (driving in from Austin) her sister Lyn’s husband Patrick and his son, Cole (flying in from Phoenix and Dallas respectively), her brother Grant and his son Ashten (Raleigh), and her sister Jenny’s husband Mark, also from Raleigh. Unfortunately, Lyn’s son Luke couldn’t make the trip, but he will be greatly missed. ← Lost legend – Paul Redfern and the birth of aviation in Columbia, S.C.
We eagerly await the next chapter!